During the deformation of TRIP steels, the retained austenite also transforms to martensite with increasing strain, which results in an increase of the work hardening rate at higher strain. Silicon, aluminum or a combination of Si and Al must be present to suppress the carbide precipitation during the bainitic transformation. The strain level at which retained austenite begins to transform to martensite is controlled by the carbon content in the retained austenite. At low carbon levels, the retained austenite transforms almost immediately upon deformation, increasing work hardening rate and formability during the stamping process. At high carbon contents, the retained austenite is more stable and begins to transform only at strain levels beyond those produced during stamping and forming, and the retained austenite is still present in the final part. It can then transform to martensite during a crash, and thereby provide greater crash energy absorption. TRIP steels can provide either (a) excellent formability for stamping complex parts or (b) exhibit high work hardening during crash deformation and provide excellent crash energy absorption. The paper of Srivastava K.A. et al deals with the effect of heat treatment on microstructure and mechanical properties of C–Mn–Al–Si cold-rolled TRIP steel. The chemical composition of the TRIP steels used in this study is given in Table 1. The CMnAlSi TRIP-aided was prepared as 50 kg ingot in an air induction furnace. The cast ingot was forged into a 300 mm × 120 mm × 50 mm block. Small blocks of 120 mm x 120 mm x 50 mm were cut from forged stock. These 50 mm thick blocks were soaked at 1150°C for 1 h, and hot rolled to a thickness of 3 mm in eight passes. Hot rolled plates were annealed at 900°C for 1 h to reduce the hardness for easier cold rolling. The hot-rolled air annealed steel plates were pickled in a 25 vol% HCl solution and subsequently cold-rolled to achieve a final thickness of 1 mm. The equilibrium Ac1 and Ac3 temperatures and the theoretical limit for bainitic transformation (T0) temperatures were found from the phase diagram calculated using Thermo-Calc Software. The intercritical annealing and isothermal bainitic transformation temperatures were selected based on these calculations. The phase transformation behavior was also studied by means of dilatometry. Solid cylindrical samples with a diameter of 3 mm and a length of 5 mm, cut from a hot-rolled sheet, with an initial pearlite-ferrite microstructure, were heated to 1100°C at 1°Cs-1 under vacuum. A dilatometer was used to measure dilatation across the sample diameter. Comparisons were made between thermo-calc results and the dilatatometry experiments for CMnAlSi cold-rolled specimens. Ac1, Ac3 and MS temperatures were also determined by dilatatometry curves. In order to obtain a TRIP-aided steel, a two-step heat treatment was used. The cold-rolled CMnAlSi steel samples were heat treated in two separate salt baths kept at two different temperatures to simulate intercritical annealing and isothermal bainitie transformation, respectively. The salt solution consisted of a mixture of BaCl2 (80%) and NaCl (20%). The isothermal bainite treatment was carried out at a temperature 10°C higher than the nominal MS (400°C) temperature, followed by air-cooling. The four sets of heat treatment are summarized in Table 2. Cold-rolled heat-treated samples were prepared for microstructural study with LePera colour etching technique. 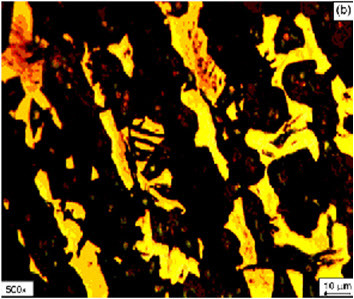 The volume fraction of retained austenite and its carbon content after the heat treatment was measured using X-ray diffraction. The room temperature tensile properties (proof strength for 0.2% offset strain, ultimate tensile strength and elongation) of heat-treated samples were evaluated on a gauge length of 50 mm with 6.4 mm nominal width. Tensile tests were carried out in an INSTRON universal testing machine using a load range of 5000 kgf. The crosshead speed was maintained at 5 mm/min. The fractured surfaces of tensile tested specimens were examined using scanning electron microscopy (SEM). The thermal dilatation was measured for both the ferrite and the austenite and the transformed fraction was calculated from the dilatation curve. The measured transformed fraction is compared with the values calculated using Thermo-Calc Software in Figure 2b. It may be seen from ﬁgure that a good match exists between the calculated and experimental values for the steel composition. 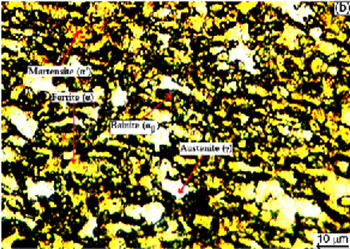 Figure 3: Microstructure of CMnAlSi TRIP steel: (a) forged sample (b) hot-rolled and (c) cold-rolled samples, etchant: 2% nital for (a) and Le Pera for (b) and (c). Microstructure of the samples at various stages of processing before heat treatment is shown in Figure 3. 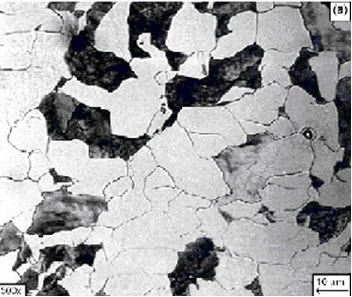 Optical microstructure of the samples A and C, i.e., after heat treatment is shown in Figure 4. 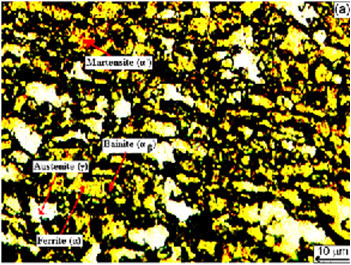 Various phases in the microstructure are identiﬁed in Figure 4: the areas displayed as yellowish are ferrite, the bright white patches are retained austenite, tanned regions are martensite and dark areas are bainite. 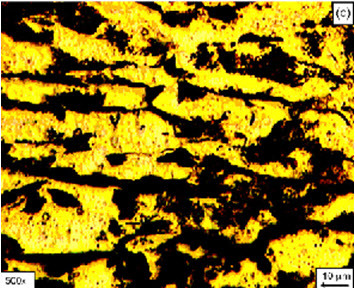 Retained austenite phase is homogeneously distributed throughout the microstructure, and are connected to adjacent ferrites or bainites. The volume fraction of austenite is about 7% in sample A and about 8% in sample C.